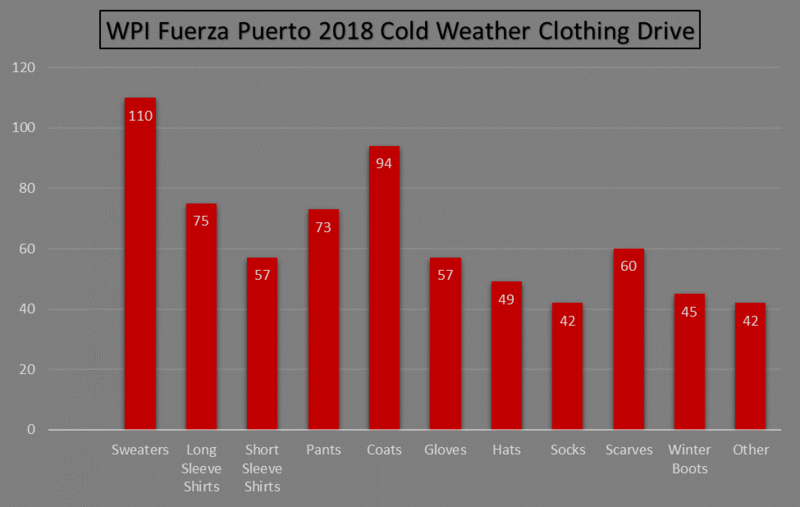 Fuerza Puerto Rico Cold Weather Clothing Drive Comes to An End! The Office of Multicultural Affairs and Residential Services would like to thank the faculty, staff, and students of WPI for helping to donate over 700 individual pieces of cold weather clothing to Centro, Inc., a local non-profit, multicultural, social services organization. So far, Centro, Inc. has provided intake support to over 300 individuals and families who have relocated to Worcester from their homes on the island of Puerto Rico after last year's devastating hurricane. The WPI community will continue to do all we can to support our fellow Americans who have been impacted by the barrage of hurricanes that ravaged the southern US and the Caribbean. The Office of Multicultural Affairs will continue to notify the WPI community of other opportunities to support this most important effort.